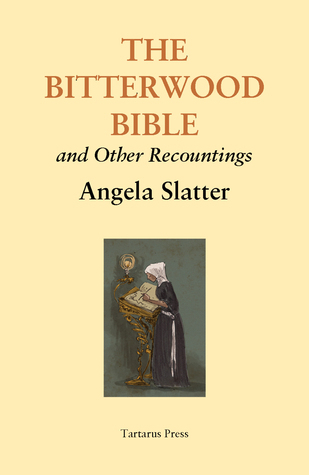 The Bitterwood Bible and Other Recountings is a remarkable short story collection with sharp prose, dark edges, and feminist themes. All that said, I, strangely enough, didn’t love it as much as Angela Slatter’s previous collection, Sourdough and Other Stories. It might be a difference in expectations. I had no expectations for Sourdough but high expectations for The Bitterwood Bible. But I also found myself tiring of repeated stories dealing with sexual assault in similar ways. “The Maiden in the Ice” (tw: sexual assault) is the backstory to a character we see in Sourdough, Ella. A little girl named Rikke finds a young woman frozen in the ice of the river… but she’s still alive and there’s something strange about her. Highlight the following to see spoilers: ( Ella is gang-raped by three boys, and since they’re the sons of prominent citizens, the town does nothing. She gets her revenge on the town ). But that’s so similar to another story in the collection, “The Burnt Moon” (tw: sexual assault). Here, the beautiful young Hafwen is raped by the miller, and instead of receiving any sort of justice, the town decides to burn Hafwen as a witch. Hafwen’s mother then takes vengeance into her own hands. Both these stories wind up being about a woman who is assaulted, a town who looks the other way, and the subsequent punishment brought down on the townspeople. It just feels unnecessary, and it makes me start to wonder about the way sexual assault is used in relation to this collection’s dark feminist themes. I’m similarly a bit conflicted about “The Coffin-Maker’s Daughter.” It’s a wonderfully creepy tale with a twisted as heck protagonist named Hepsibah Ballantyne. Only I’m also super glad this wasn’t the only story with a queer protagonist because Hepsibah is pretty darn rapey and it started to remind me of the predatory lesbian stereotype. She shows up in another story as seducing schoolgirls and it’s not something that sits very comfortably with me. I’ve referenced this in passing, but the stories of The Bitterwood Bible and Other Recountings are interconnected. They all take place in the same world, some share the same city or town, and some of the same characters appear throughout the collection. Indeed, as the stories go on, you begin to realize that there’s an overarching villain flitting through the edges of these recountings and a group of women who set themselves opposite him. It’s marvelously clever and brilliantly realized. “By My Voice I Shall Be Known”, for instance, leads directly to the events of “Now, All Pirates Are Gone.” A simple seamstress has given all her love and money to a budding merchant who promises to marry her once he’s established. He betrays her, and she exacts vengeance… not only upon him but upon his new wife. I wasn’t thrilled that her method of vengeance was to attack another woman, but the story acknowledges that and makes it clear she’s an anti-heroine, not a heroine. “The Badger Bride” tells of Gytha, the daughter of Hafwen from “The Burnt Moon.” She’s a copiest and bookbinder who has been given the task of copying out a book of magical spells. It reminds me a bit of Ursula Vernon’s work but darker. The self-same magical book comes up later in “The Bitterwood Bible,” where you find out how it came to be and the story of a girl called Murciana. Her story intersects with the Little Sisters of Florian, who are the closest the collection comes to having an overarching protagonist. The Little Sisters of Florian are dedicated to the preservation of knowledge, seeking out books, storing a library in their citadel, and making copies to be sent out into the world. I love the idea for the Little Sisters so much! “St Dymphna’s School for Poison Girls” follows a young member of the Little Sisters sent to infiltrate a school for assassin-brides. Here, girls are trained to kill their husbands and in-laws on the wedding night or afterward, in return for long-held family grievances. While so many of the stories in the collection take root from vengeance, the acts of revenge of St Dymphna’s School are presented as petty and the students so eager to rush to fulfill their duty that they don’t even think of surviving after the assassinations. But our protagonist isn’t meant to be an assassin — she’s come looking for a book on poison. “St Dymphna’s School for Poison Girls” was one of my favorite of the stories. The concept of assassin-brides and quests for books is so awesome, how could I not love it? However, my favorite story of the collection is a vampire tale, “The Night Stair.” Adlisa wants vengeance (see, I told you vengeance was a common denominator) for her sisters, who were both chosen to become the daughter of the Lord and Lady. The Lady has a madness that drives her to try and replace her lost child with a mortal girl from the town she rules over. But these girls walk a thin line, and no one can remember the last time a girl lasted longer than two years before the Lady eventually killed her. Adlisa has a plan, and it involves becoming the Lady’s daughter. It’s a darkly glinting story that I just adored. It’s got to be one of my all-time favorite vampire short stories! There were a few other stories in the collection, but I’m going to stop here. This review is long enough already, and I think you’ve gotten a feel for what this collection holds. While I didn’t love The Bitterwood Bible and Other Recountings quite as much as the other collection by Slatter I’ve read, it’s still a marvelously written, compelling set of stories. I really wish Slatter was better known, and I hope she finds the audience she deserves!